Was Biden referencing Palin in his comments about stem cell research? (CNN) - John McCain's campaign hit back hard at Joe Biden Tuesday after the Democratic VP candidate appeared to suggest Republicans who do not support stem cell research - like GOP VP candidate Sarah Palin - are lacking in their support of children with disabilities. “Barack Obama’s running mate sunk to a new low today launching an offensive debate over who cares more about special needs children," McCain-Palin spokesman Ben Porritt said. "Playing politics with this issue is disturbing and indicative of a desperate campaign." The sharp response, indicative of the increasingly heated rhetoric from both presidential campaigns as the election enters the final stretch, came shortly after Biden said advocates for people with disabilities should support stem cell research. Biden did not mention Palin - the mother of a baby with Down syndrome, and someone who has said she will be a “friend and advocate in the White House" to parents of children with disabilities - but seemed to direct a question to her. 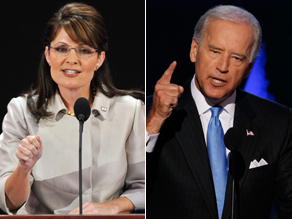 Biden spokesman David Wade insisted Tuesday the Delaware senator's comments were not directed at Palin. "This is a clash of policies, not a clash of personalities," Wade said. "We've heard not a dime's worth of difference between the McCain-Palin ticket and the Bush Administration on medical breakthroughs that millions of parents and doctors believe could save lives and transform the quality of life for countless Americans." The question is ABSOLUTELY valid. And many of us with birth defects would ask the very same question of this two-bit hypocrite opportunist. Sarah Palin is lying to the American public to get votes. This will come back to bite her. Support of Stem Cell Research is a legitimate issue in this campaign. Stem Cell research and other related research has the potential to allieviate Parkinson Disease as well as other diseases related to the nervous system. The world should know the stands of the candidates on this issue. The fact that Gov Palin has a disabled child who might some day benefit from stem cell research is irrelevant. The fact Gov Palin would oppose research which would benefit my parent(s) or children is relevant and a legitimate subject of the campaign. For the past 7 years, the present Bush Administration has waged a war against science. Would a McCain Administration continue the same policies regarding science and scientific research? I think it was a fair and reasonable question to the GOP campaign. Everytime they're asked about the issues, they cry attack. Give me a break! I just cant wait to see the Palin interview on Thursday; she won't have McCain to hide behin then. Um, nothing particular to this post but did Obama all of a sudden hand the election over to Mccain? Whatever happend to his money advantage? I hear more about Mccain's ads than Obama's..
Fighting for Obama Since he is too political correct! Send out the Hounds on that mut dog! That is very low. It is a personal attack on a 5 month old. Biden is horrible and just wait – this will backfire! By the way – I support stem cell research. Giant step backwards for women and science if the Replicans win. It's too depressing to even think about. REBUBlicans are pathetic. it is a policy issue. It is not a swipe at palin please. Life does not revolve around that extremist christian. Way to go Joe! You got the reaction you wanted, now Palin and McCain will either be forced to defend the fact that this is yet ANOTHER issue they disagree on, (pork barrel spending and now stem cell research) and/or Sarah Palin will be forced to stop using her disabled son and all of the rest of her children for political gain. It's on folks, if any of you think the Dems of 2008 are as slow and uncalculating as the Dems of 2004 you have another thing coming.